Havant, Hampshire-based load cell manufacturer Straightpoint (SP) received the Business Achievement award at Action Coach’s regional annual awards ceremony, which took place at the Royal Maritime Club in Portsmouth, UK last month (February). SP had been under the business stewardship of Action Coach, which helps entrepreneurs and owners overcome the challenges in maintaining a company, for five years. At the forefront of the partnership was the business relationship between SP owner and managing director, David Ayling (now global business development director for load monitoring solutions), and Gary Mullins, master coach at Action Coach. Under Mullins’ tutelage Ayling became a consummate planner and drilled his company on the art of goal-setting and measured performance. As has been widely reported, at the turn of the year, Ayling oversaw the sale of the company to the largest lifting, rigging, and material handling hardware company in the world, The Crosby Group. SP has been well decorated over time by Action Coach, in the Hampshire and Sussex region on Mullins’ watch, notably in the Sustained Business Performance and Business of the Year categories. However, the latest recognition was a special award reserved for SP to commemorate the sale of the company, which Mullins called, “the highest accolade” for any business owner. 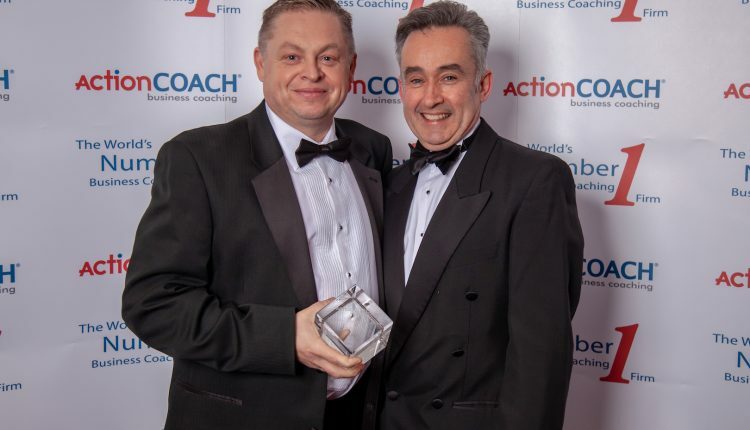 Picture: Straightpoint’s David Ayling (left) receives the Business Achievement award from Action Coach’s Gary Mullins.